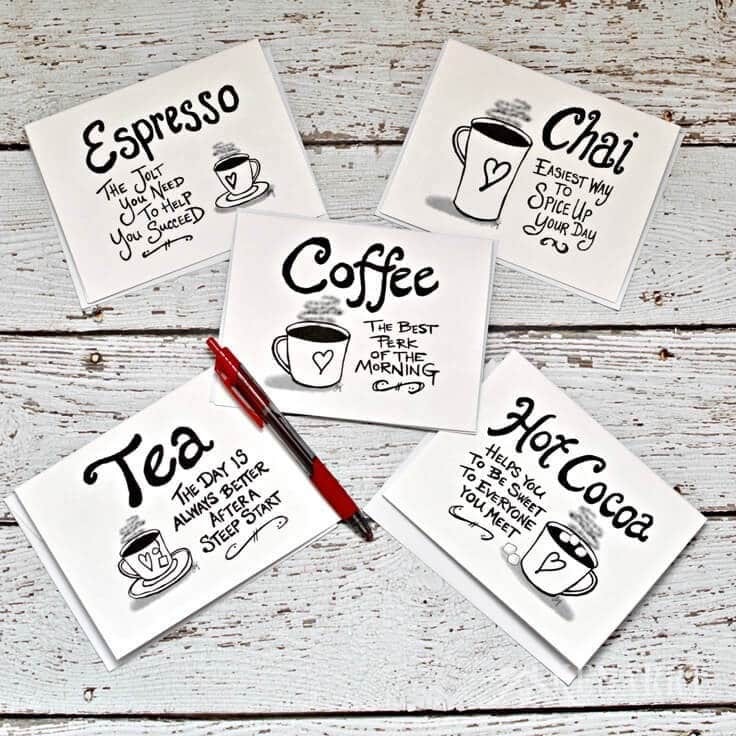 Coffee note cards are blank inside and come with 5 designs. Digital printable sets are available for instant download and make a great gift. Need to send a card right now, but you don’t feel like going to the stationery store? Digital printable note cards will save you the trip! The printable coffee note cards we designed are blank inside and come as two separate sets, each with 5 unique designs. The printable greeting card sets are inexpensive and available for instant download now on Etsy. 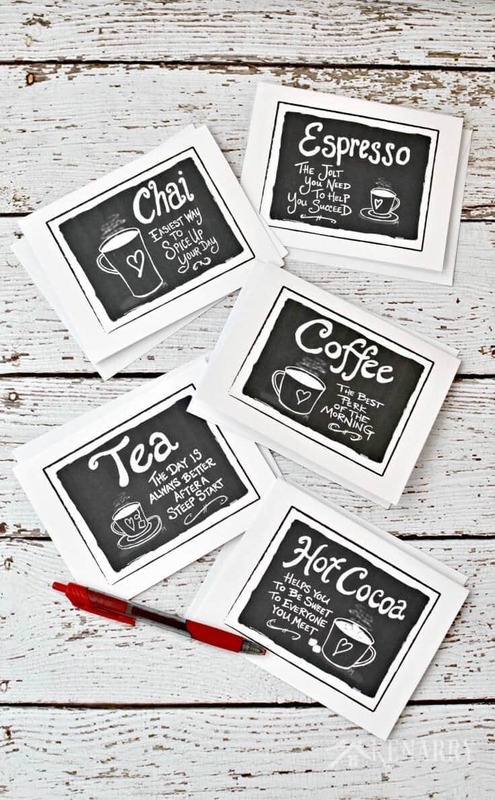 Use them for yourself or print a few sets to create a special gift for the coffee or tea lover in your life. Let’s say a friend is having an unexpected bad day. Or your sister and her entire family are under the weather. Or maybe after a busy morning getting the kids on the bus, you almost forgot it’s your boss’ birthday today. You don’t have time to go to the store. You need note cards right now. That’s the beauty of digital printable note cards, you buy them once and you have the file to print greeting cards on demand whenever you want. Several weeks ago, we announced the launch of our new Etsy shop featuring digital hand drawn art and craft supplies. 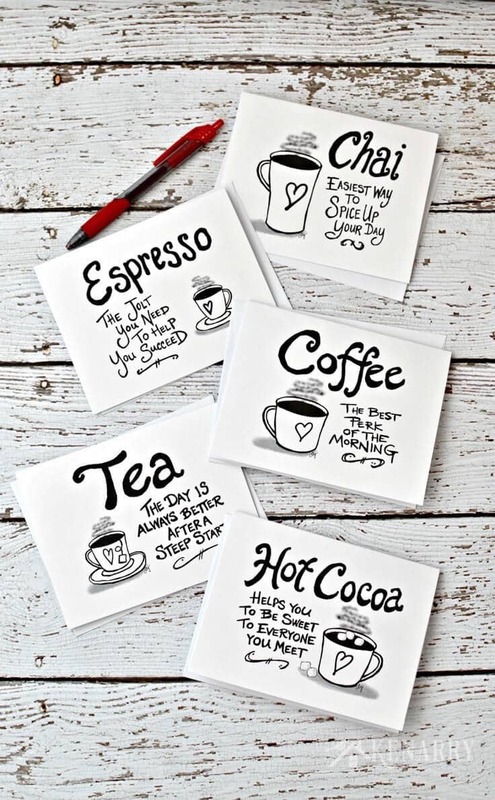 Our first collection of digital art includes ten different kitchen prints showcasing sayings about hot beverages like coffee and tea. The more I looked at these initial designs in our Etsy shop, the more I thought they would be super cute as printable note cards! Printable note cards are great to use as stationery for yourself, like when you want to send a little note to that friend who’s having a bad day. Or you can print several at a time and pair with fun envelopes and stickers to create a fun gift for family and friends — or the boss whose birthday you just remembered! 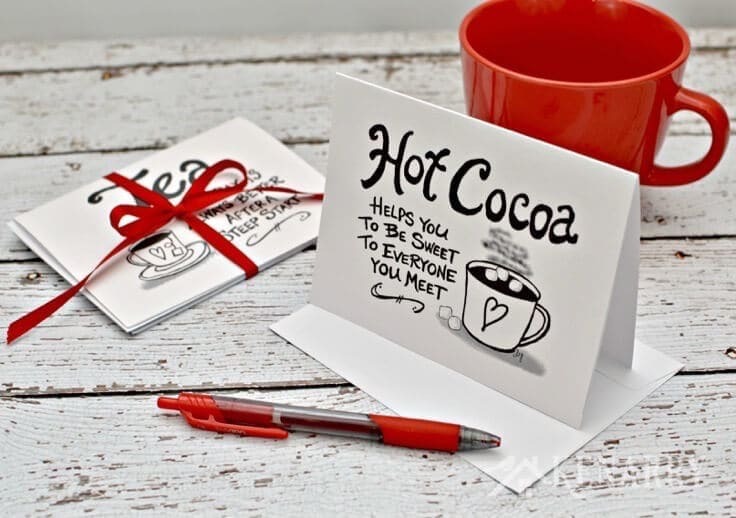 The instant download printable greeting cards I designed feature five of your favorite hot beverages: coffee, tea, chai, espresso and hot cocoa. 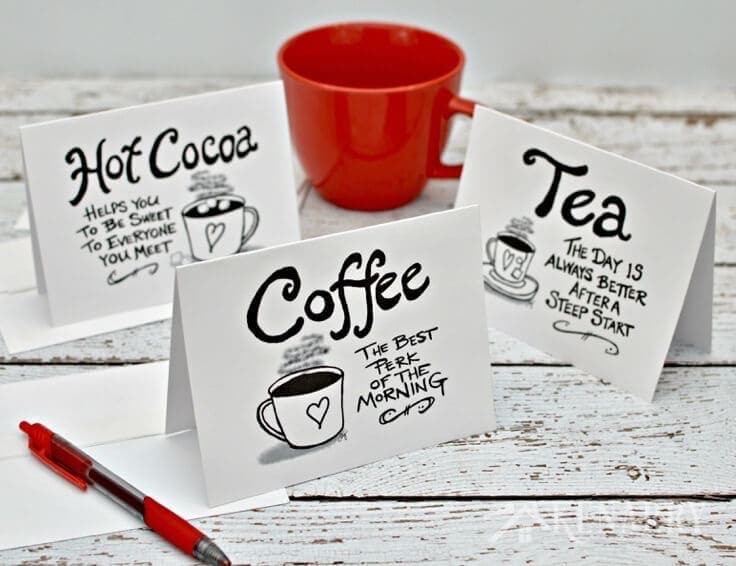 Each digital note card set is hand drawn and showcases whimsical original sayings I created and hand lettered. 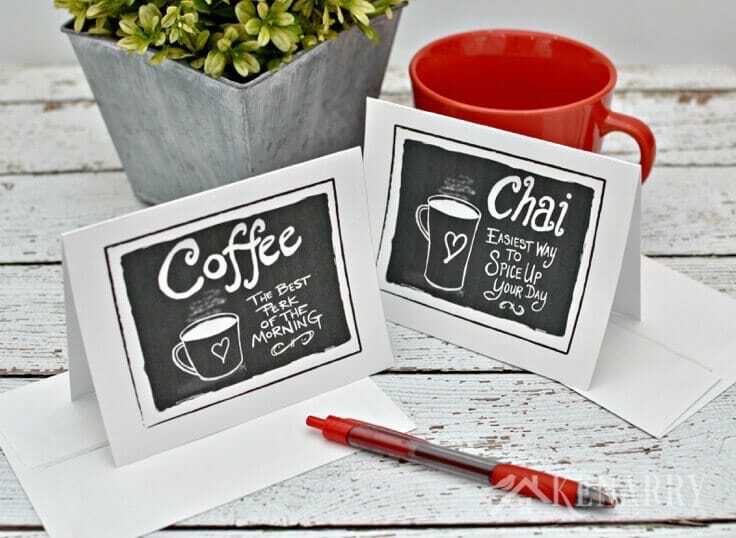 The coffee note cards are blank on the inside so you can add your own personal greeting. We now offer two different note card sets for sale in our Etsy shop. One set has designs with white backgrounds and the other set features chalkboard backgrounds. 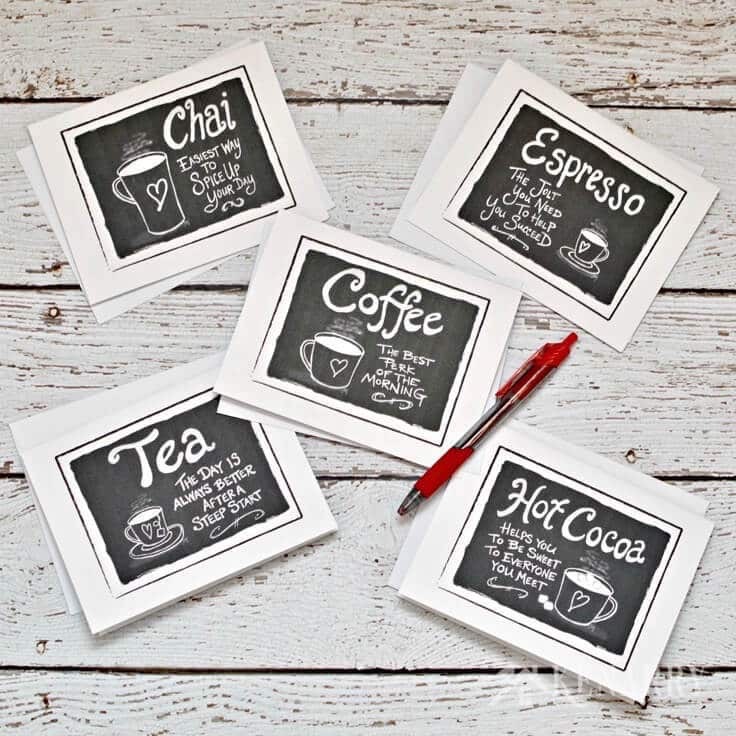 Each set of coffee note cards comes as a 3 page digital PDF displaying five different note card designs that you can print on standard 8 1/2″ x 11” card stock. The final size of each card after printing and folding is 4 1/4″ x 5 1/2″. Once you buy the set you want on Etsy, you’ll have immediate access to the file so you can print now without waiting for your new note cards to be shipped to you. NOTE: This is a digital product only. The note cards do not come with envelopes, but are designed to fit in any A2 invitation envelope (4 3/8” x 5 3/4″). Printable greeting cards can be mailed individually to your loved ones in a standard A2 envelope you can buy online or in an office supply store. (NOTE: Physical envelopes are NOT included with this digital product and must be purchased separately.) The cards are blank on the inside so you can add your own personal note. Print a bunch and tie them together with pretty ribbon as a holiday, birthday, Mother’s Day or teacher appreciation gift for a coffee or tea lover in your life. I think red envelopes, hot pink envelopes or bright blue envelopes would really make these note cards pop! 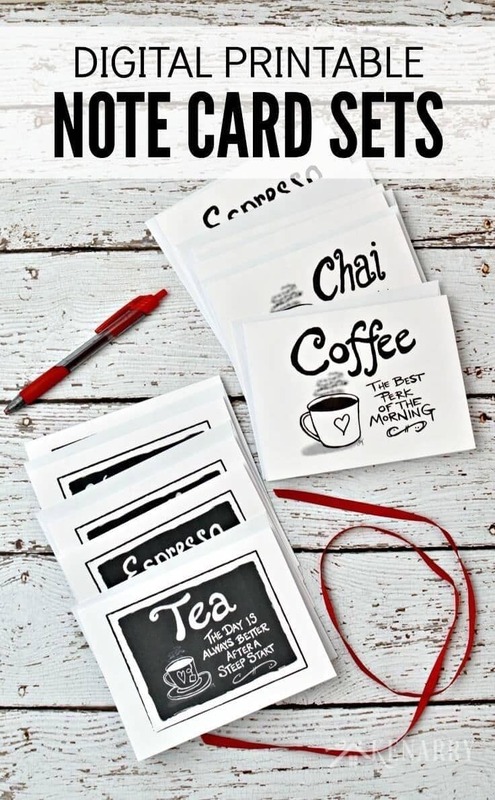 Create a hospitality or hostess gift basket for a friend or family member including a mug, coffee, chai or cocoa mix, tea bags, a great book and one or more of these cute note cards. 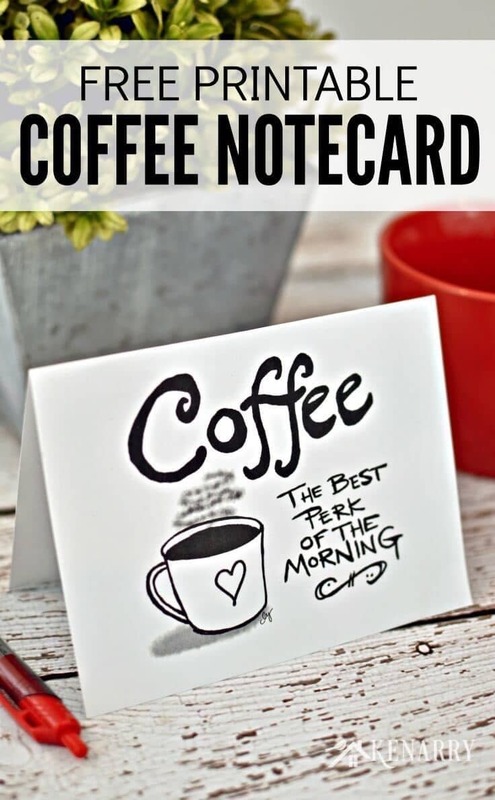 Get One of the Printable Coffee Note Cards for Free! 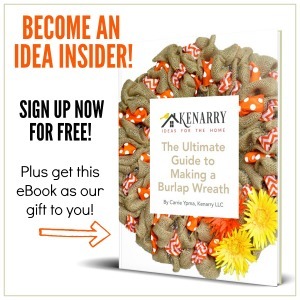 We love our Kenarry readers and want to give you one of our new note card designs for free! 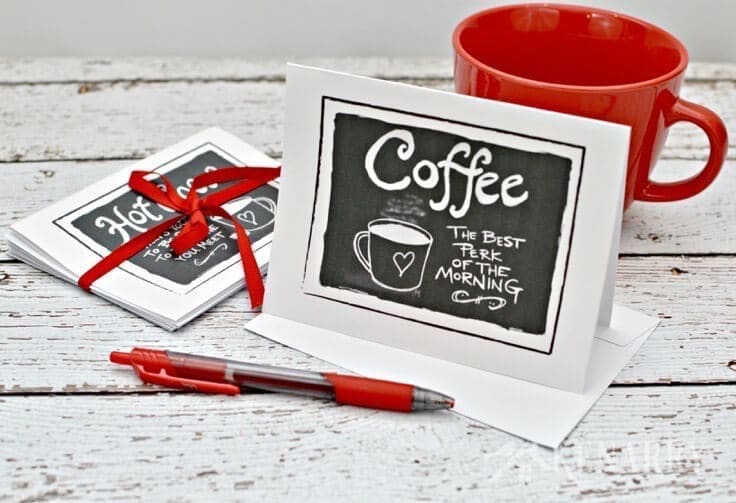 The individual coffee note card with the white background is available as a FREE gift when you sign up below! Then you just need to download the PDF file for the coffee note card and save it to your computer. The coffee note card and all other free printables from Ideas for the Home by Kenarry™ are for your own PERSONAL USE ONLY. 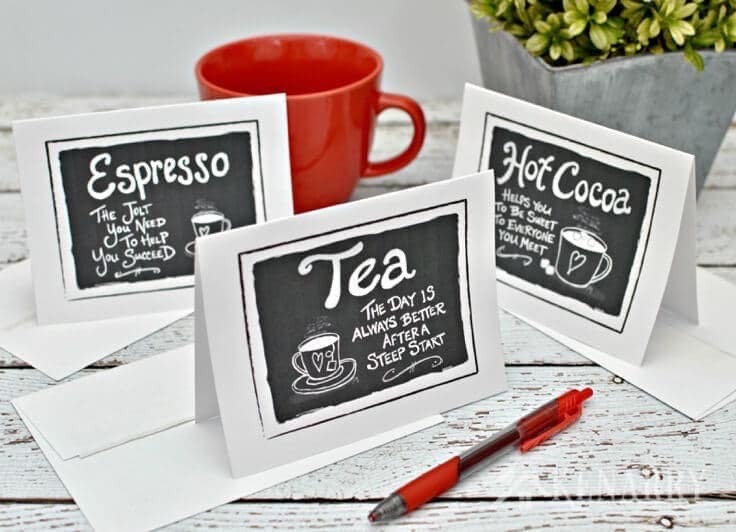 Once you have the file, print the coffee note card on white card stock as many times as you’d like!